‘Absolute chaos’ encountered by Southern rail passengers waiting for rail replacement buses between Gatwick Airport and London has been criticised by passengers. Over the course of three weekends Network Rail engineers are working to improve the track between Purley and Gatwick Airport. This meant that buses replaced all trains between Redhill and Gatwick Airport on Sunday (February 24), no direct trains between London and Gatwick or the Sussex coast, with Thameslink trains running between Brighton and Gatwick. However long queues built up at Redhill station, with some passengers reported missing their flights. Stephen Trigg, chairperson of Reigate, Redhill and District Rail Users’ Association, said the group had previously raised concerns and called the situation ‘extremely dangerous’. One passenger said it was a ‘miracle no one was killed’, while another described conditions at Redhill station as a ‘kind of dystopian human holding pen’. Others described the scenes as ‘absolute chaos’ and a ‘shameful mess’ with some passengers ‘sobbing’. A video shared on Twitter shows a rail replacement buses reversing very near to crowds. The RMT union, which is fighting the further extension of driver-only operation on Southern services, claimed the weekend’s events demonstrated that Southern ‘aren’t fit to run a bath let alone a railway’. The union repeated calls for Govia Thameslink Railway, which runs Southern services, to be stripped of the franchise. A spokesman for GTR said: “We apologise to any passengers delayed at Redhill yesterday. Demand for the rail replacement service was very high. We will ensure that plans for upcoming weekend engineering works take a higher capacity requirement into consideration. “We secured additional bus services throughout the day to help to get passengers on the move, with some services added in the afternoon specifically offering a shorter Redhill to Gatwick route. “These additional buses helped to significantly reduce passenger wait time for connections. Peter Smith is a Crawley borough councillor who was caught up in yesterday’s disruption. 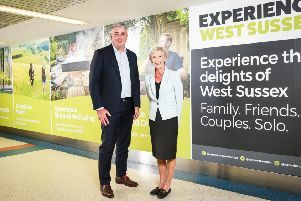 Henry Smith, MP for Crawley, said: “I welcome the £300 million engineering upgrade work currently going in to the Southern area rail network, however unnecessary disruption caused this last weekend which affected a number of my Crawley residents when seeking to travel from Redhill and Gatwick was unacceptable. The Association of British Commuters called for the regulator to intervene and suggested the event was ‘entirely foreseeable’. A spokesman for The Office of Rail and Road said it was carrying out preliminary enquiries and gathering information, but had already contacted GTR to seek assurances there would not be similar scenes over the next two weekends. The ORR is urging passengers to claim back for delays through the delay repay scheme, which can be done against the revised timetable put in place for the engineering works. Were you affected? Email the newsdesk.